Reading is my second passion. Combine that with a busy work-from-home mom role, and you start to see the problem here. So I did the completely logical thing and decided to start my own blog. There was nothing wrong with me starting my own blog, but I soon realized I was in it for all the wrong reasons. Today I want to share with you my journey to discovering God’s plan for me and how I learned to use my talents and abilities the right way for me. And I still get to blog along the way! I dreamed of starting a blog, but I wasn’t sure I had time to manage things all on my own. So I asked a dear friend to start a blog with me and so launched my blogging career. As all bloggers know, there are numerous conferences you can attend to increase your knowledge, learn about the next great social media, gain writing and speaking confidence, and network until you drop. So of course, I decided we needed to attend a speaking and writing conference because, after all, I wanted to be somebody. My blogging partner already had a successful blog with weekly encouragement for moms, so this joint blog was just another fun thing on her list. When we arrived at said speaking and writing conference I had no idea what I was doing there. Confusion overwhelmed me, and we discovered we were fresh out of ideas as far as blog topics, themes or where we should be heading on our joint blogging journey. All I could find myself saying was why in the world am I at a speaking and writing conference when I don’t really want to speak and I don’t love writing? This is a huge mistake. I knew in my heart that I was a business girl through and through. I love the idea of having a blog. But I don’t love writing for a blog. I love all the behind-the-scenes work that goes into marketing and managing a blog. I love the business side of blogging, not the creative side of it. God has made me uniquely who I am. I don’t need to try to be somebody else. I spent a lot of my conference weekend praying about whether or not I should be focusing all my efforts on this barely-producing mommy lifestyle blog. I soon realized I needed to stop that blog. I was trying to force something that wasn’t there. As I spent a lot of time in prayer that conference weekend, God really laid on my heart one message: Heidi, I did not create you for this role. I didn’t create you to speak and write as a mommy blogger. I created you to serve those who speak and write. My whole world changed in the best way possible. I had freedom and I knew exactly what I was supposed to be doing as a work-from-home mom. I had not a single client, but I had the confidence of knowing that God would provide at just the right time. As soon as I gave up the blog, things started to happen. I connected with two different bloggers at that same speaking and writing conference and began work as their virtual assistant just two days later. Over the course of my first year in business, I had the privilege of working for over 20 different bloggers helping them with anything and everything blog and business related. And I love it. I have talents and abilities that make me unique and that only I can do. There is no one else who can do things in exactly the same way I can. When I realized I needed to stop trying to be someone I was not, I began to feel completely comfortable in who I was and the gifts and abilities I did have. I love being a mom. But I also love to work. By using my talents and abilities, I am able to run my own business helping others. I get to do the tasks I love to do while the bloggers/creatives do the tasks that they love to do. It’s a winning situation for everyone. My encouragement for you today is: do what you’re good at. You have your talents, gifts and abilities for a reason. You’ll be happiest when you’re using those abilities instead of trying to do or be something that isn’t you. Consider what you have to offer. The world needs what only you can give. Since giving up my joint blog with my friend, God has given me a new blog. Writing is still not my heart and my passion, but sharing my story is. I love the picture of mentorship and not only continuing to learn and grow in my own life and business but also being able to help others who want to have their own business. So besides running my business (where I currently work with the best business owners/bloggers in the WORLD), I am also sharing my story and creating products to help others be successful as they balance home management, family time and working from home. Organization, time management, setting goals and helping others get started as virtual assistants are just a few of the things I talk about as I seek to encourage. 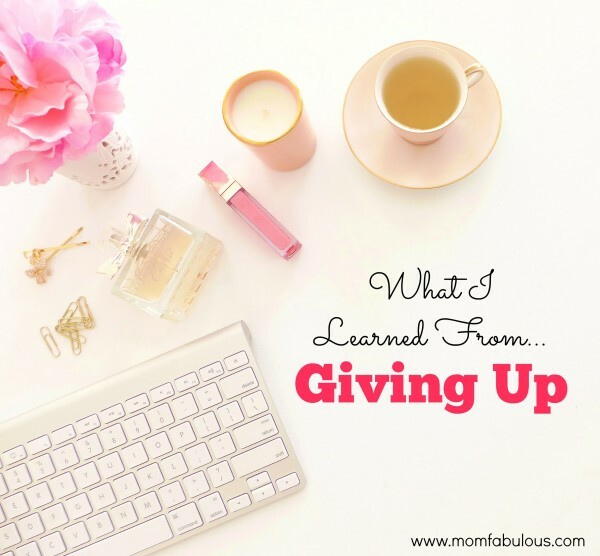 While my topics have changed, my passion for blogging has not. I still work daily with blogs and bloggers, but it’s in a completely different way than how I started my blogging journey. Focus on what you know and then apply it to a niche or a job. I realized I need to give up being a blogger in order to help with blogs. It’s okay to give up. You never know where it might take you. You just might find it was the best thing that ever happened to you! If you’d like to read more about managing your family and home life while being a work-from-home mom, you can follow Heidi at www.heidimaranell.com or connect with her on Pinterest or Instagram!